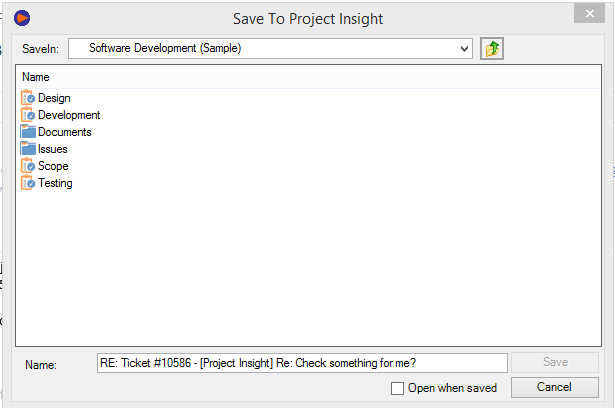 Emails can be added to Project Insight through the use of the Outlook Connector. From the email, select Add-Ins and then Save to PI. Be sure to select the folder where you want to save the email using the Outlook file interface. You then be able to see the email in Project Insight within the folder where you saved it. Any attachments that existed in the email are also uploaded and show as a sub-item. As with other documents, emails can be edited using the edit icon once uploaded. However, you may want to consider restricting this ability with administration permission settings to preserve the document trail. For example, the Project Insight administrator may determine that any folders used as email containers are set to read only without change permissions.